When making lists of potential guest stars for Season Two of The Muppet Show, comedian and actor (and writer and art collector) Steve Martin seemed like an obvious choice. Steve Martin didn’t host Saturday Night Live until the start of the second season so Jim didn’t cross paths with him there, but they would have known many of the same people. And Steve’s zany humor which Jim would have witnessed when Steve did host SNL was a perfect fit for the Muppets. Many of the guest stars on The Muppet Show were encouraged to do things that they were not known for but had always wanted to do on camera. Opera star Beverly Sills hung a spoon from her nose, sung a country/western song and tap danced, Christopher Reeve traded his Superman tights for Shakespearean tights, and tough guy actor James Coburn played ragtime on the flute. Steve Martin, however, did all the things in his repertoire that had already made him famous: he wore an arrow (seemingly) through his head, he did a bit with balloon animals, he played his ramblin’ banjo piece, and he demonstrated his juggling techniques. Martin’s act was so in tune with the Muppets that if he had learned to throw boomerang fish, he could have been a regular member of the cast. This was just the start of a long relationship with the Henson team. 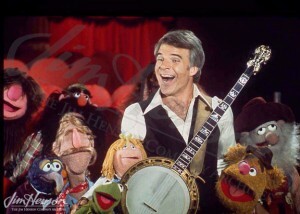 For The Muppet Movie, shot in 1978, Steve Martin stretched his acting skills in his first non-musical film role. He played the sarcastic waiter at the Terrace Restaurant where Kermit and Miss Piggy were trying to have a romantic dinner. Wearing short lederhosen, Martin looked appropriately ridiculous and did his best to ruin the meal. In 1985, he appeared with the Muppet Babies in print in a feature in Muppet Magazine. Around the same time, Martin appeared as the sadistic dentist in Little Shop of Horrors, the first non-Henson film directed by Frank Oz. Martin and Oz would work together many times over the ensuing years, with Martin starring in the Oz-directed films Dirty Rotten Scoundrels (1988), HouseSitter (1992), and Bowfinger (1999). Steve Martin on The Muppet Show, 1978. 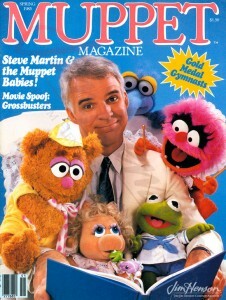 Steve Martin and the Muppet Babies, Muppet Magazine, Spring 1985. This entry was posted in 07-July '77, 1977, Muppet Babies, Muppet Movie, Muppet Show, Saturday Night Live and tagged Beverly Sills, Christopher Reeve, Frank Oz, James Coburn, Kermit, Miss Piggy, Muppet Magazine, Saturday Night Live, Steve Martin, The Muppet Show. Bookmark the permalink.